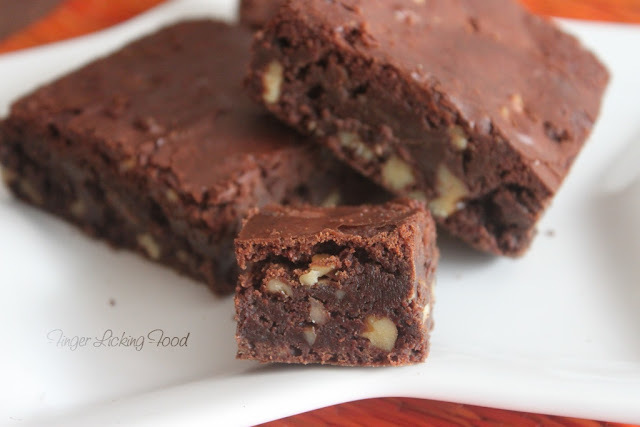 Brownies – simple, no fuss no muss pieces of chocolatey goodness ready to pop into your mouth in a single bite or several bites;my definition of this popular classic. Here I have adapted one of Ina Garten’s recipe for outrageous chocolate brownies. 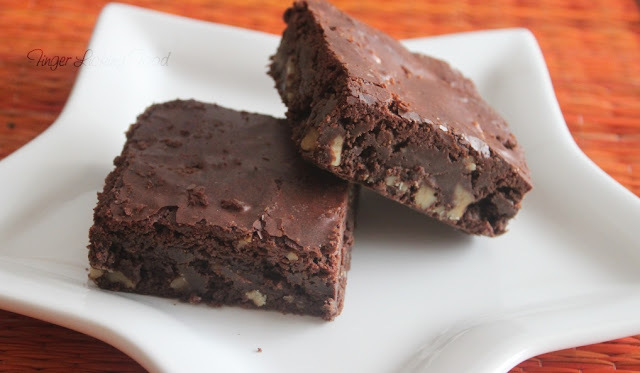 When I first saw her make it on the show Barefoot Contessa on Food Network, I was drooling and was waiting for an opportunity to make these brownies. I tweaked it a bit to suit my taste and played around with the different types of chocolate. I also added in a bit of chili powder to give it a kick…. If you haven’t tried it yet, chili and chocolate together tastes insanely good. The recipe below feeds a whole lot of people, so halve the recipe if you need or better still make the whole batch and freeze what you don’t need right away. Preheat oven to 350 F. Butter and flour a 12x18x1-inch baking sheet. Melt together the butter, pound of chocolate chips, unsweetened chocolate and the bitter sweet chocolate using a double-boiler or a heat proof bowl set over a pot of simmering water where the water doesn’t touch the bowl directly. Allow to cool slightly. In a large bowl, stir (do not beat) the eggs, coffee granules, vanilla, chili powder and sugar until combined. Stir the warm chocolate mixture into the egg mixture and combine well. Let cool to room temperature. In another bowl, sift together 1 cup of flour, baking powder and salt, then add to the cooled chocolate. Toss the walnuts with remaining ½ cup of flour. Add this to the chocolate mix and combine well. Pour into the greased pan and bake for 20 minutes. Tap the sheet on your baking rack to release the air between the brownie dough and pan. Continue baking for 15 more minutes. Do not over bake and check by inserting a toothpick in the center. If it comes out clean then the brownie is done all the way. Once chilled, cut into cubes, bites, chunks…anything that makes it easier to sink your teeth into! Looks delicious! 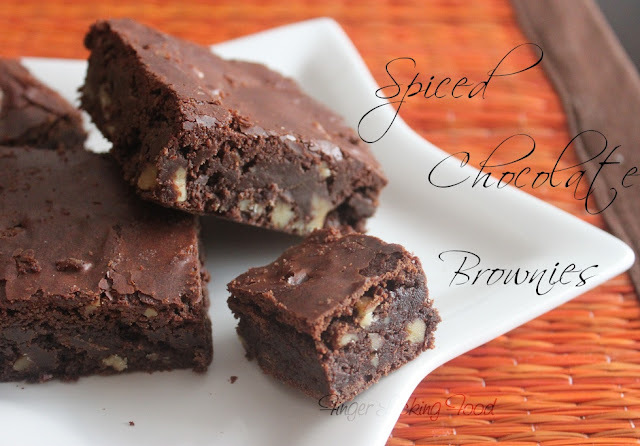 I haven't tried spiced chocolate brownies before. Will try it out sometime. Thanks for the recipe. Chillie powder? Sounds crazy, but might be fun to give it a try... and if they look as fabulous as you have pictured them, I'm sure they taste wonderful too. This is my first time here, and you have an interesting blog. I just cannot bare to read the recipe the ingredients only have me drooling! I am bookmarking this recipe and coming back to reading it only when I buy all the chocolates! Please excuse me. I will definitely comment when I have finished making these beauttttttties. This looks awesome! Going to have to try this for my next cookout or tailgating browni party . I am yet to try chilli and chocolate together. Those brownies look fabulous. Such a fabulous and yummy cake.